Most people who bought into Bitcoin early are celebrating its incredible surge in value. But not the ones who have forgotten the password to their Bitcoin wallets. Japanese workers are a little too dedicated to their work, to the point that employers sometimes can't get them to go home. Enter T-Friend, an unfriendly drone that plays loud, annoying music meant to chase employees out of the building. Consumer Reports tested the new iPhone X. 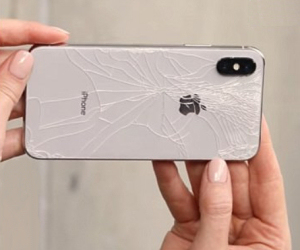 They found it offered an extra 30 minutes of battery life compared to the iPhone 8, but after dropping it 100 times, the glass on the back of the iPhone X "was significantly cracked." Who would've guessed? Google and Amazon are hurting their customers by blocking each other’s products. Google plans to block YouTube on Amazon's Fire TV and Echo Show devices. Amazon refuses to sell Chromecast and the Nest Thermostat (both Google products) on its ecommerce site. The U.S. Navy has fallen out of love with its awesomely powerful electromagnetic railgun system, after spending $500 million on its development. But its specially-built bullets are still being considered for powder-based firing systems. USPS workers nationwide complain they are being forced to fake delivery dates to meet quotas set by Amazon and other major shippers, which put bonus money in USPS managers’ pockets. A British man demonstrated how easy it is to become the number-one ranked restaurant on TripAdvisor by gaming the rating system to push his garden shed into that coveted spot. In a new phone scam, thieves who steal phones in bars are impersonating bar managers when the victim calls, seeking the “lost” phone. The crooks then demand the phone’s passcode in order to “verify” the victim’s ownership, which gives them full access to sensitive data on the phone. NASA is restoring the original Apollo Mission Control Center in Houston. Space Center Houston, a nonprofit 501(c)(3) foundation, spearheaded the effort to raise funds for the project. The restored historical landmark will open to visitors in July, 2019, unless Houston has another problem. Central Maine Power’s $200 million smart meter upgrade is supposed to help the utility track outages and send email or text alerts to customers. Unfortunately, the system’s radio transmitters are affixed to the same utility poles whose falls cause the electricity outages. The Los Angeles Police Department has warned drivers not to blindly follow GPS and crowd-sourced traffic apps when evacuating their homes. There’s a reason why those recommended routes are “lightly traveled” during wildfires. Most recent comments on "Geekly Update - 13 December 2017"
On a related note, studies show that 63.5% of all statistics are made up on the spot. Or.... How do we know that this is a true statement, and not just made up to be funny? Because it _is_ somewhat funny. Can we really trust the FCC to do anything right??? The FCC needs to be completely deregulated and shut down. It took them 11 years to [b]deregulate telegraph services[/b], after the last message was sent by the Western Union???!!! Please, tell me why should we trust the FCC with Net Neutrality or the Internet in geneeral??? Regarding the phone scam of phones stolen in bars, the thieves will be S.O.L. if the phone requires a 'facecode' instead of a passcode? Google Translator came up with 'BRILLIANT' when I used it? David is correct, however Bob didn't say to put the code into Google Translate. He said to use Morse Code Translator and that is the link he provided. And it works fine. Not sure what John did because Google Translate does not translate Morse Code to English. Mme Moxie, the FCC news story came from a Cato Institute website. Given that this is a pro-free-market, pro-small government think tank, you can expect that sort of bias or spin on the story. Just because the regulations were still on the books because the FCC hadn't gotten around to repealing them, it doesn't meet the FCC was devoting staff resources to enforcing them. If they had been, you could be sure Cato would have reported that in the story. What they don't say says as much as what they do. Don't sacrifice valuable Internet protections based on what far-right spin doctors say to discredit an agency. I think it's highly improbable that each one of your Geekly Updates will make me 146% smarter. Surely there must be some sort of deviation. Does each edition have the same effect on all readers, or do you rely on self-selecting samples? Best wishes for health and happiness to you and all my fellow readers of your posts. I remember (I`m older than dirt) a news item at the end of WW2 stating the Nazis had developed an electromagnetic gun. In fact I half-built one. Has it taken this long to develop? This is evidently 'rocket science' to translate Morse Code. Copy Paste the ALL of the dots and dashes (maybe some are on the next line) into the first box of the Google Translate. Then click the box that says "Translate" and the text BRILLIANT will appear in the second box. As a retired postal worker, I can verify firsthand managers and supervisors can and sometimes do falsify data on reports to keep themselves out of hot water with higher-ups, but falsifying package deliveries is a new low. It's essentially lying to the public for personal profit, the personal profit being in the form of bonuses if they maintain a 99.8 on-time delivery ratio, per the terms of their contract with Amazon. James, seriously, do you think the occupant of the White House is going to be wasting time on this kind of thing? I'm pretty sure Bill Gates wasn't cleaning up obsolete code before he retired! Thanks for the heads up on HP laptops...got a affected one still in the box new...will make sure it's patched. Geo; My solution when entering sensitive key punches is using Oxynger KeyShield and a regular keyboard. Typing a character or two on one, then the same on the other, alternating until finished. Oxy is supposed to be secure from keyloggers. But switching back and forth is more secure I hope. "James, Dec. 14 2017": the term mentioned re the FCC was "11" years. There would have been two (2) occupants of the White House during that eleven-year period. Would you care to put a name to your reference? [FDR was the only elected president who occupied the White House for more than eight (8) years as far as I can tell.